Our pricing structure is simple, straightforward and HONEST— NO UP-SELLS, NO PER SPOT FEES OR CHARGES, EVER!!! We have an EXACT-imate pricing guarantee. If you are asked to pay more than your EXACT-imate your carpet cleaning is FREE! We provide our clients with honest, upfront and affordable flat-rate pricing. Our prices are all-inclusive and make it easy to know exactly what your carpet cleaning costs will be. Our prices never change from the time you book your services to the time we arrive and include all spot removal, pre-treatments, deep cleaning AND FREE odor neutralizer. No pricing gimmicks or bait & switch tactics. With CitruSolution Carpet Cleaning, pricing and quotes are simple and honest. 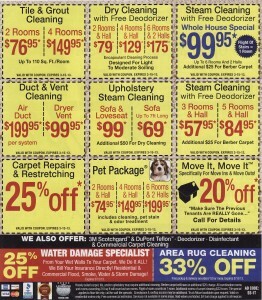 We offer the best carpet cleaning pricing Atlanta with NO PER SPOT FEES and NO UP Sells! We are ALL, or at least MOST OF US, are on a budget and would rather not have to pay more for something than we have to. We also like to get a “good price,” or at least feel like it was a good deal. The problems arise when you don’t ask the right questions. Even though wanting to know “How Much?” is probably more important to you than HOW?, it shouldn’t be. Most of the low-ball, “discount” carpet cleaners are using soap and water and are more likely to cause more problems with the carpet than solutions. And that’s only IF, and that is a BIG IF, they actually charge what they estimate. You don’t want soapy detergents used on your carpet because that’s going to leave a residue that causes dark, discolored spots. FIRST, you don’t want high pressure sales, nor up-sells, or things you don’t want or need. We should expect to pay what we are quoted. That’s why we took the time to call in the first place. And if we didn’t care about cost we wouldn’t ask. But if you’re going to ask, ALWAYS follow up when you’re given a quote with, “Can I make the check out before you get here?” and wait.